Basseterre, St. Kitts, November 30, 2017 (SKNIS): During his monthly press conference (November 29), St. Kitts and Nevis’ Prime Minister, Dr. the Honourable Timothy Harris, said that first time home owners and those whose homes were damaged during the passage of Hurricanes Irma and Maria will be given duty-free concessions on building materials. Prime Minister Harris stated that the government’s first time home owners’ assistance programme accords concessions for materials valued up to $400,000. Above the $400,000 mark, duty and other taxes will be paid. On February 22, 2017, during an interview on “Working for You”, Minister of Human Settlement with responsibility for Housing, the Honourable Eugene Hamilton, said the Government of National Unity will put in the necessary infrastructure in 28 areas identified for persons who want to start to build. This was announced to ensure that persons who plan to build start the process of getting the finances to do so. Areas where infrastructure will be put in place include Taylor’s East Housing Development, Farms Meadows; Farms Development; Keys; Belmont Residents in Cabbage Tree; Crab Hill; Crescent Hill; Dewars Estate Residences; Dupont Heights; Keys South; Lamberts Greens; Lodge Slopes; Lower Hermitage; Middle Island; Mol-phil (the area between Molineux and Phillip’s); Race Course Housing Extension; Saddlers North Extension; Shadwell (both the industrial estate and the housing developments); Stone Fort; Trinity Hill; Upper St. Mary’s Terrace; St. Peter’s Commercial Development; Stapleton Gardens; Cabbage Tree; Hermitage Highlands and Wingfield View. The minister said that if things work the way they have planned, these areas are on the priority list for the completion of the infrastructure, specifically the laying of roads. The minister said that the Ministry of Sustainable Development, on the other hand, is also working on the completion of the water and electricity in these areas that do not have. 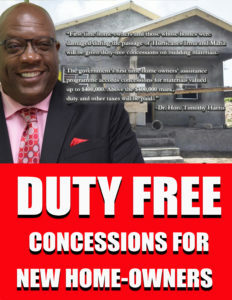 Additionally, Prime Minister Harris announced during his post-Hurricane Maria National Address on September 23 that persons whose homes suffered damage from the hurricane should take advantage of the duty-free concessions on the purchase and/or importation of building materials. 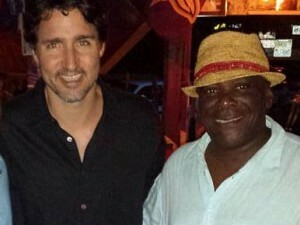 “The Government is intent on helping to restore normalcy to the lives of all persons in the quickest time possible. We also hope that the repairs would result in a much stronger and more resilient housing stock in the Federation,” said the prime minister during the September 23 address.